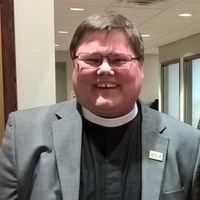 Join Evan Fischer, rector of St James Episcopal Church in Wooster, Ohio, for a conversation about his experience as a transgender man and clergy person. Evan's talk will be followed by a celebration of Holy Communion at 5:30 p.m. in the Chapel of the Holy Spirit. All members of the Kenyon Community are welcome to attend. Sponsored by Canterbury, Hillel and the Office of Spiritual and Religious Life.